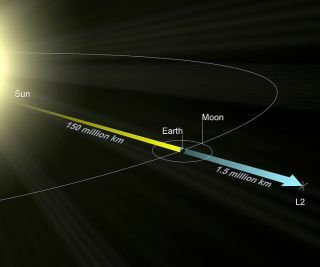 This NASA diagram depicts the location of the sun-Earth L2 Lagrange point, which lies about 1.5 million kilometers from Earth, on the opposite side of the sun. China's second moon probe is parked at a stable spot in deep space, called a Lagrangian point, as part of a new mission to study the sun and Earth's magnetic field. The multi-tasking spacecraft, called the Chang'e 2, completed its moon mapping mission earlier this year. Its new mission may be a signal of China's expanding prowess in space — not only for scientific purposes, but perhaps for showcasing strategic intentions, experts say. China's State Administration for Science, Technology and Industry for National Defense has heralded the repurposed probe, which has made China's space agency the third ever to visit a Lagrangian point. Missions launched by the European Space Agency and NASA also visited Lagrangian points. Liu Tongjie, the deputy director for the second-phase project of the China Lunar Exploration Program, said Chang'e 2 new position allows it to tackle two scientific tasks: observing the Earth's magnetic field and charting solar storms, according to a China Daily report. Yet another assignment for October is for Chang'e 2 to help assess the capability of two large deep space communications antennas in China, Liu said. One antenna, 115 feet (35 meters) in diameter, is being built at Kashgar in the northwest. The second antenna is nearly twice the size, with a diameter of nearly 210 feet (64 meters), and is being built at Jiamusi in the northeast. These antennas will be part of China's deep space network, reportedly to take shape in 2016 and built to handle possible future exploration of Jupiter and the poles of the sun. Lester told SPACE.com that getting this kind of experience under your belt is really handy if you want to do clever maneuvers in the general vicinity of the Earth-moon system with little energy. "It would be interesting to hear the plot here, but just the decision to do this comes as no big surprise," Lester added. "I wouldn’t interpret it as any more than an exercise in navigational ability and station-keeping. Not real easy to do … so it's a good test." L2 is where many Western science spacecraft are stationed, Lester noted, and after spending some time there, Chang'e 2 could flip out to other Lagrange points. "It can be retargeted to some interesting bodies, using lunar gravity-assist maneuvers," said Robert Farquhar, a leading U.S. expert on orbital mechanics and author of the new book: "Fifty Years on the Space Frontier: Halo Orbits, Comets, Asteroids, and More." "I have some ideas where Chang'e 2 could go, and I'm hoping to present my plan to the Chinese in the near future," Farquhar said. This photo, taken by China's Chang'e 2 lunar probe in October 2010, shows a crater in the moon's Bay of Rainbows. The image is one of the first released to the public by China's space agency. Edward Belbruno of Princeton said the movement of Chang'e 2 "illustrates that China is mastering some subtle orbit dynamics and capabilities to have a spacecraft maneuver away from the moon for little fuel to go to Earth-sun L1." Belbruno masterminded a new approach to space travel by finding low-energy pathways using unstable chaos and dynamical systems, called weak stability boundary theory. Chang'e 2's movement also involves capabilities for deep space tracking and communication out to 1.5 million kilometers from the Earth, Belbruno pointed out, where L2 and another Lagrange point, L1, are located. China's mastery of reaching L2 is important for several reasons, Belbruno said. These points are far from the Earth, he said, and spacecraft located there can perform scientific measurements and observations in a benign environment. "Perhaps more significantly, low-energy pathways lead away from L1 and L2, which can be exploited to send spacecraft to Jupiter, Mars, asteroids, for less fuel. They make an excellent staging point," Belbruno said. "Placing spacecraft at these points gives one a high ground, so to speak." Not only would they be interesting places to position a space station, but from there China could perform planetary exploration, both in piloted and automated mode. "The fact China has sent their lunar spacecraft to [L2] shows a long-term commitment to space exploration," Belbruno said. Dean Cheng, a research fellow on Chinese political and security affairs at the Heritage Foundation, a conservative public policy think tank, sees Chang'e 2's orbital gymnastics as part national pride, part scientific curiosity, and part political move: doing things at a First World level. "Space, with its high visibility and obvious high-tech aura, is a major opportunity to do this," he said. A Chinese Long March 3C rocket launches the unmanned Chang'e 2 lunar probe toward the moon on Oct. 1, 2010 from the Xichang Satellite Launch Center. But to what extent could Lagrange points also fortify military space operations for China? In terms of strategic military use of L-points, "there are some interesting ideas (though from our side) about the utility of L-points as parking spots for reserve in-orbit spares and possibly for anti-satellites coming in from outer orbits, taking out GEOsats (geostationary satellites) and the like from unexpected angles," Cheng said. He said the possibility of in-orbit spares probably merits further investigation. "If you think that there could be a conflict, and you had the initiative on when it might start, you might want to deploy systems farther out, where they’d be harder to monitor, in anticipation that your in-orbit systems may be attrited through a variety of means, and it'll be hard to replace them," Cheng said. Given any worry that launch sites, production sites or other infrastructure might be targeted — and not just physically, but through cyber- and other means — then you definitely might want to pre-deploy systems into orbit or farther out, Cheng said. "This is speculation, however, and not necessarily based upon specific Chinese claims or writings," Cheng emphasized.